Silver Salmon & Trout Fishing is Incredible Right Now! 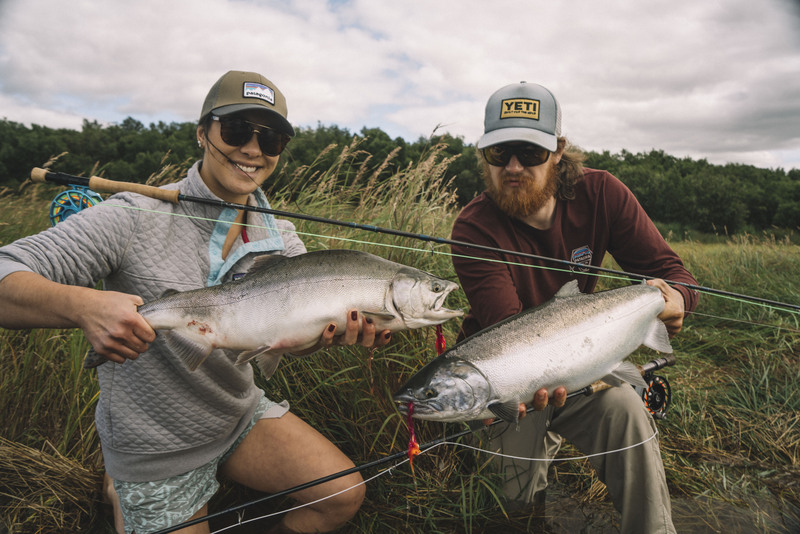 Posted on August 28, 2018 | by Katmai Trophy Lodge | Leave a Comment on Silver Salmon & Trout Fishing is Incredible Right Now! The Naknek River has been taken over by a flood of Coho also known as Silver Salmon. There has been limits of these awesome fish covered in sea lice caught everyday this week on flies and spinning tackle. The Chinook and Pink salmon in the Naknek have started dropping their eggs into the river quickly altering the rainbow trout diet. Trout fishing has been awesome fly fishing with beads is just starting and should fish great until after the salmon have spawned and died. Small remote streams are still fishing well, with some of them passing their summer peak others are still getting better. If you are willing to fly Bristol Bay has a seemingly endless supply of remote streams and locations and there is almost always a couple that are having incredible fishing. Silver Season is Beginning on the Naknek! Posted on August 2, 2018 | by Katmai Trophy Lodge | Leave a Comment on Silver Season is Beginning on the Naknek! King season is officially over on the Naknek with the last week of July being a great week for catching giant fish. Silver season is here! August 1st is the beginning of Silver season for us and we started out the season with landing some silvers but we are looking forward to the Coho fishing getting better over the next couple of weeks there are fishable numbers now, but it is just getting started and will continue to grow. While we wait for the Silvers to show up in force we will just have to enjoy the awesome Chum fishing we have been having. Rainbow fishing has been great this last week on the main river and fly out creeks. The Naknek river bows are still chasing down streamers and fattening up. Catching big rainbows on streamers is one of the reasons why the Naknek is so unique there are plenty of rivers in Alaska with great bead fishing but here they hit streamers for an extended season. The remote stream fishing has been great with now sockeyes moving into some creeks as well the list of creeks to go to is decently long and the choice can be a hard one to make some days. The Grayling and Char fishing in these locations is going great along with the rainbows. 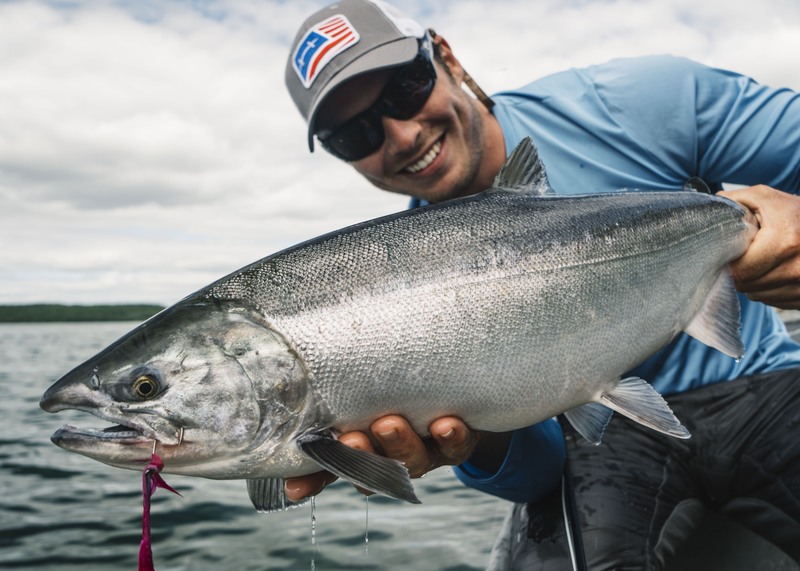 Sockeye continue to run in the Naknek and Sister rivers, the Kvichak and Alagnak. Even though it is past its peak limits of fresh fish are still being caught. Kings have stopped running in the river but are in staging areas and still biting and should continue to be good fishing until season closes with plenty of large fish being caught in the 30 to 40 pound range and even some breaking 40 pounds. Fishing streamers for rainbows has been great with large rainbows in the high 20s being caught being caught regularly and those hawg 30 inchers still making appearances. Small tributaries across Bristol bay have begun to host spawning of king and chum salmon leading to great bead fishing.